When the Civil War broke out, David McNeely Stauffer (1845–1913) was only sixteen years old. While attending Franklin and Marshall College in Pennsylvania from September 1861 through June 1863, he served brief, emergency enlistments when the state of Pennsylvania was threatened by Robert E. Lee’s forces. He joined the 2nd Pennsylvania Emergency Regiment in September 1862 and served until winter. In June 1863, he joined in the defense of Gettysburg with the Independent Battery of Pennsylvania. When Stauffer’s enlistment expired in January 1864, he briefly joined the Engineering Corps of the Columbia and Port DuPont Railroad rather than return to college. A month later, he joined the US Navy. 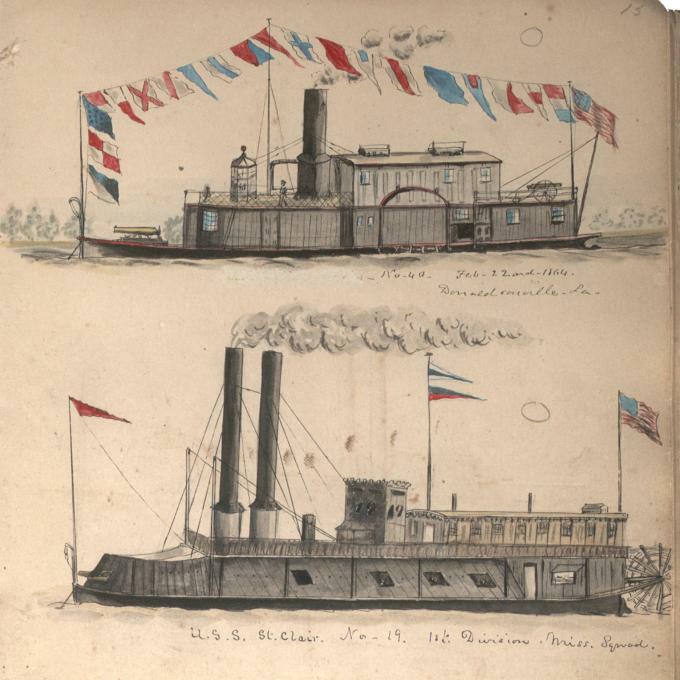 Stauffer created the images presented here in a sketchbook entitled "Louisiana Sketches 1864" while on board the USS Alexandria of the Lower Mississippi Fleet. 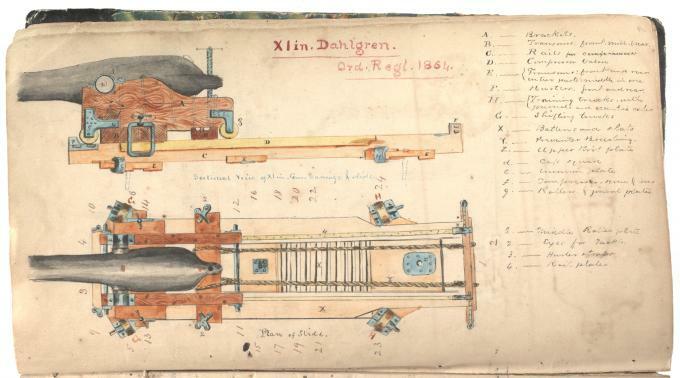 The sketchbook contains forty-four pages of ink and watercolor sketches and is one of two volumes of Stauffer’s sketches in the Gilder Lehrman Collection. We have pulled out a few of our favorites to feature here, but feel free to browse the entire book. There are more than twenty illustrations of Union and Confederate warships that plied the Mississippi Delta. 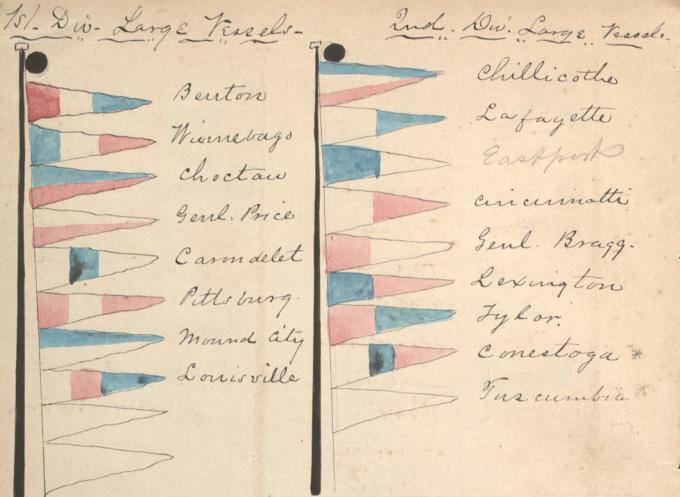 These detailed images are not only visually engaging but also provide a valuable record of the ships that served on the lower Mississippi River. The USS Choctaw was originally built as a merchant steamer and was converted into an ironclad gunboat and ram. According to the US Navy, "commissioned in March 1863, Choctaw was a singular-looking vessel, probably the most imposing in appearance of any of her Mississippi Squadron contemporaries. In actuality, however, she was weakly-armored and very slow." 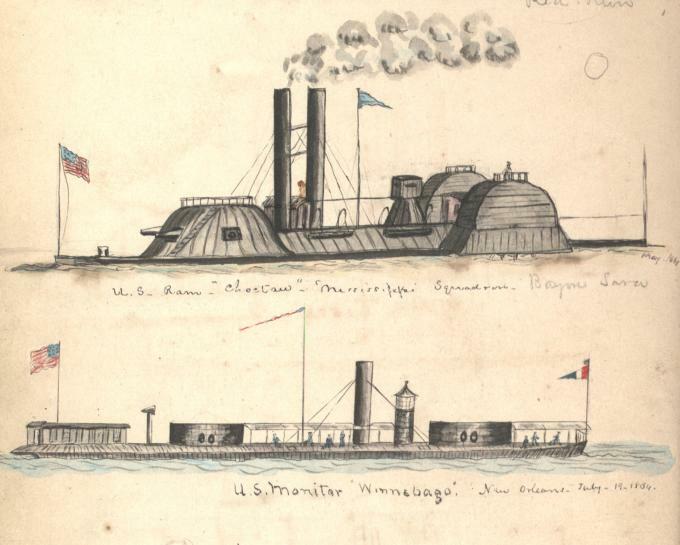 The USS Winnebago was a Milwaukee-class twin-turret ironclad river monitor built at Carondelet, Missouri, and commissioned in April 1864. The USS Alexandria (No. 40) and USS St. Claire were river vessels that were converted and brought into US naval service as light-draft gunboats. Although known as "tinclads," the ships had wooden bulwarks, rather than armor plating, for protection. Sixty-seven ships were converted for duty by the Navy between 1862 and 1865. 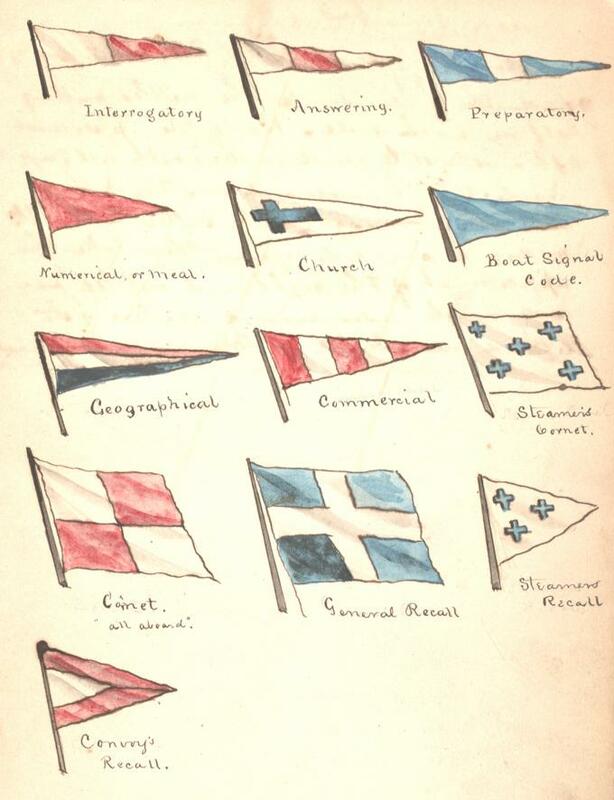 Stauffer also illustrated the identification pennants used for the various ships and signal flags used by the squadron. 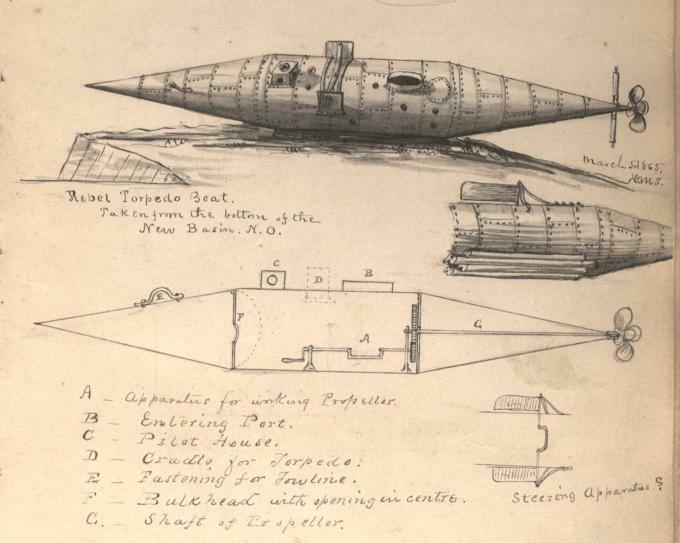 This sketch and schematic of the Confederate submarine Pioneer was made after she was salvaged from the bottom of a lake. More information on the Pioneer can be found in our Featured Primary Sources, "The Civil War and early submarine warfare, 1863." Although not of a warship, the image below captured our attention. The scale of the people in comparison to the ship suggests it was a small vessel. A little research turned up an article in Harper's Weekly indicating that it was "only fifteen feet long and four and a half feet wide, and has only a depth of two feet and ten inches. Her crew consisted of Captain JOHN C. DONOVAN, who owns the vessel, a Rhode Island sailor, and the Captain’s dog Toby." 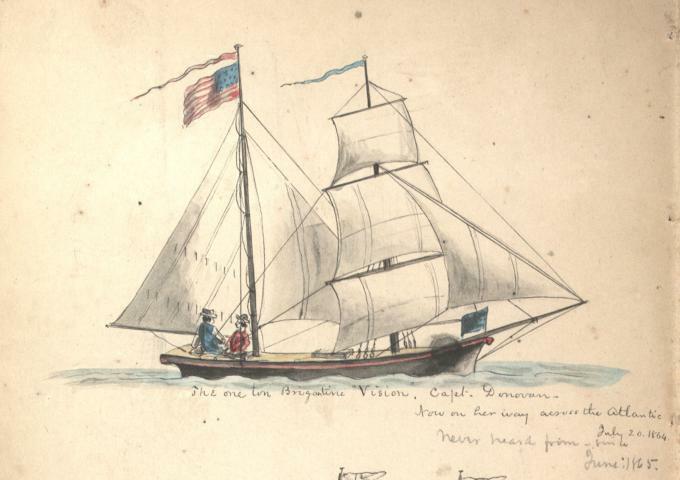 The ship left New York City on June 26, 1864, bound for Liverpool, England, but as Stauffer’s later annotation indicates, it never arrived. 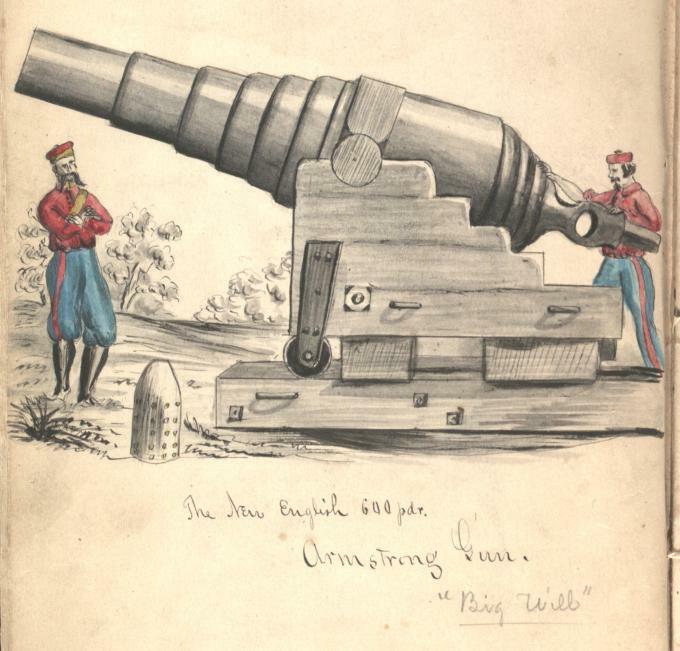 The images relating to artillery are Stauffer’s most detailed drawings. He captured the look, scale, and technical specifications of these large guns, while still presenting an interesting image. 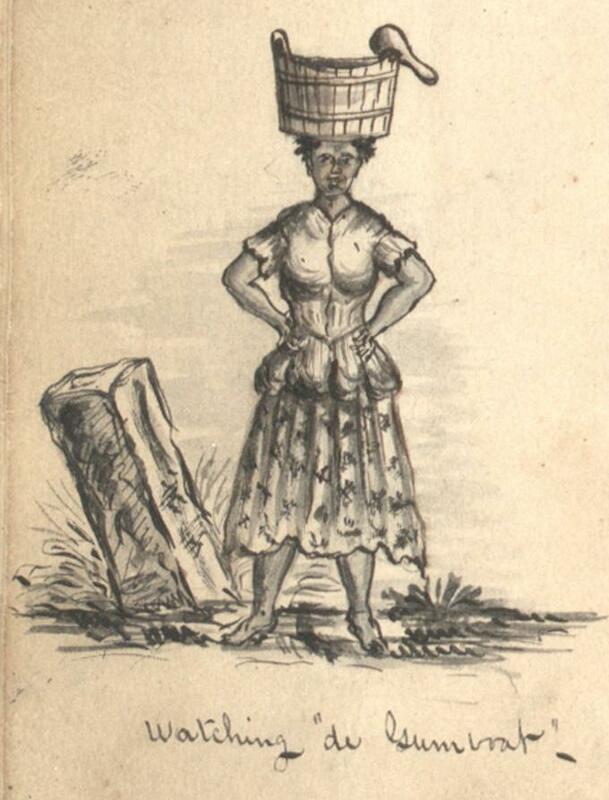 The image below is based on one printed on page 76 of Harper’s Weekly, January 30, 1864. An accompanying article (found on page 78) explains: "The latest reports from England bring us an account of a new gun, of extraordinary dimensions, weighing no less than 22 1/2 tons. This enormous bit of artillery has been built by Sir William Armstrong, under the auspices of the British Government, and has been lately tested off Shoeburyness." Rear Admiral John A. Dahlgren designed the Dahlgren gun, a muzzle-loading artillery piece primarily for use on ships, in 1849. The XI-in. Dahlgren gun shown here was produced between 1856 and 1864. 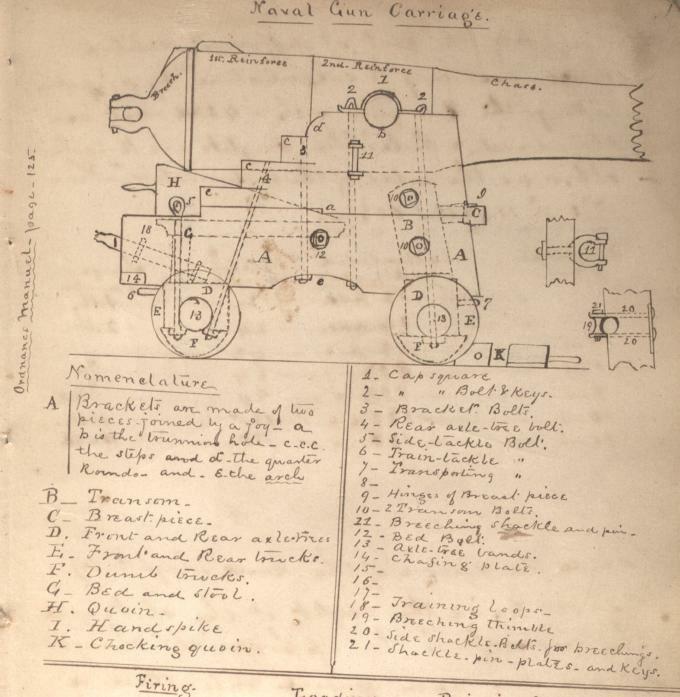 The next two images show a schematic of a naval gun carriage and instructions for operating ship’s artillery from the gun ports. 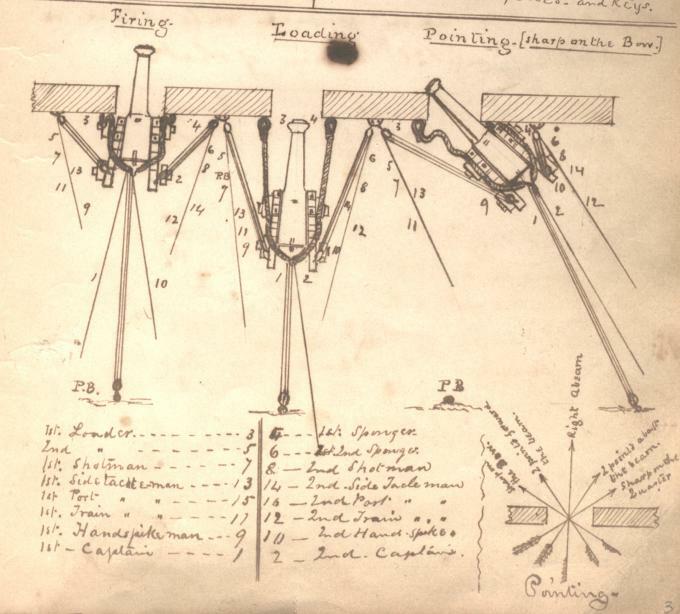 Illustrations such as these are very important if you are operating artillery on a naval warship or researching it 150 years later. Many of the images of people and buildings are from the vicinity of College Point, Louisiana, approximately sixty miles upriver from New Orleans. 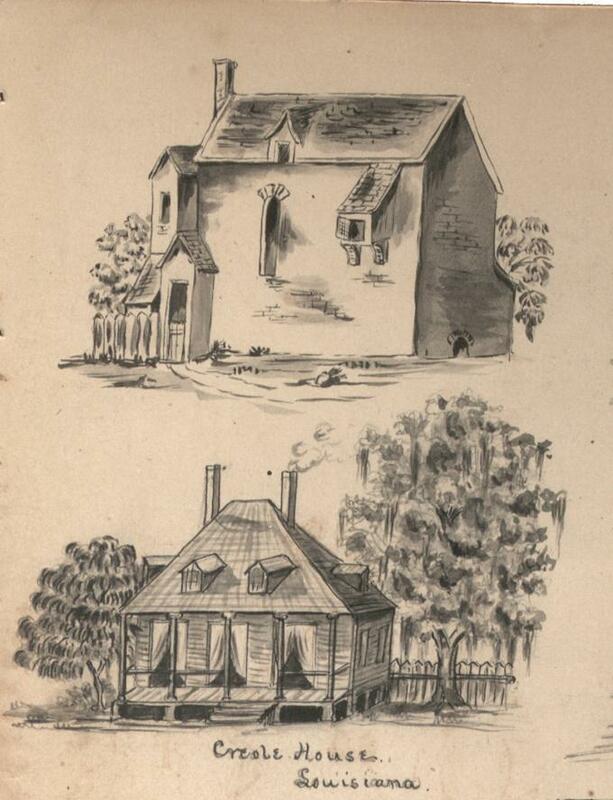 Stauffer didn’t draw plantation houses, but captured several smaller homes. The Convent of the Sacred Heart is about two miles from College Point, Louisiana. It was a girl’s school run by the sisters of the Sacred Heart order. The image shown here is very similar to one taken in the 1930s that is in the State Library of Louisiana Historic Photograph Collection. The caption "Creole House, Louisiana" at first didn’t appear very helpful. After a little research, we discovered that the image on the bottom is an example of French Creole architecture, one of the United States’ three major colonial architectural styles. The image below has no identifying caption, but is one of the few color illustrations in Stauffer's book. The simple cabin or cottage is set in a beautiful landscape. Stauffer’s book includes several pages of illustrations of African Americans in and around College Point, Louisiana. These vignettes are domestic views of men and women performing everyday tasks. They are not dramatic, stylized, or racist drawings but appear to have captured subjects as Stauffer saw them. We were particularly struck by the amount of detail in the clothing and background in these small sketches. 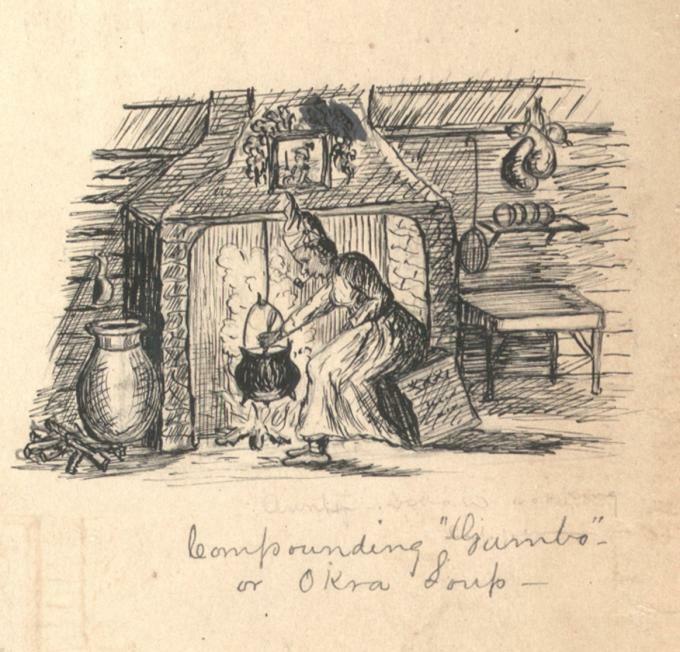 This image of a woman cooking "gumbo" has a very faint pencil notation beneath the image, suggesting that the original title may have been "Aunty Sarah cooking." It also provides an important glimpse into a Civil War–era kitchen at a time when photographs of the interior of homes were virtually non-existent. 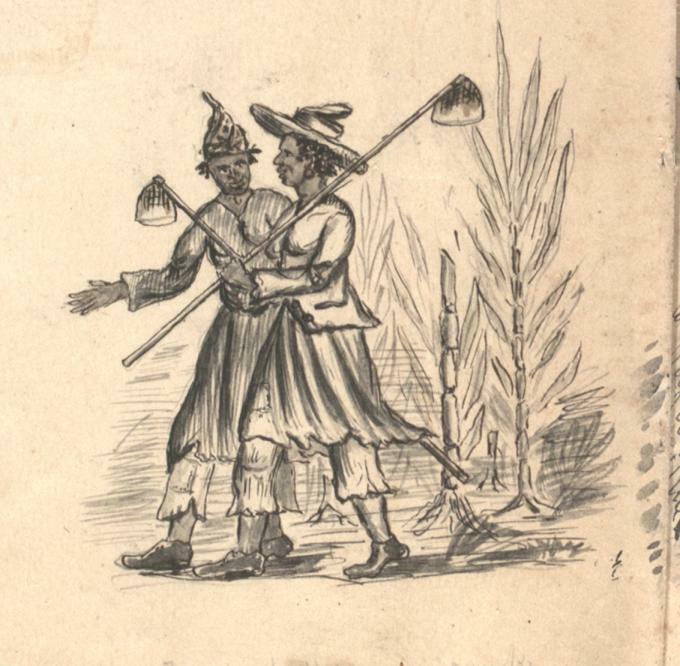 The image below contains a faint pencil inscription that reads "two female chatels working de cane." Stauffer’s reference to the women as chattel rather than slaves, or freemen is interesting. Stauffer’s subjects were predominantly women. 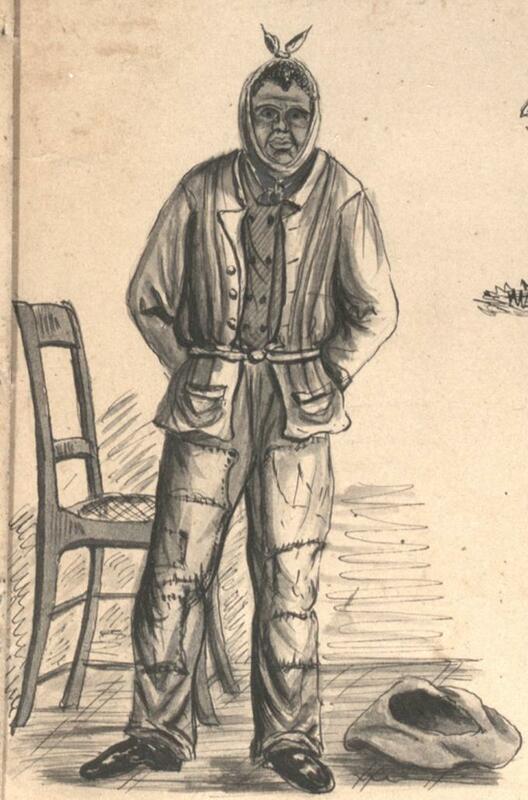 One of the few sketches of a man in his sketchbook shows him apparently suffering from some sort of head injury or malady.